Artwork of a Swoopy from Donkey Kong Country 3: Dixie Kong's Double Trouble! 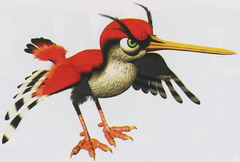 Swoopies are large, red, sharp-beaked birds encountered in the game Donkey Kong Country 3: Dixie Kong's Double Trouble!. Like Swoops, their name comes from the fact that they swoop down at the Kongs. Swoopies are the aerial equivalent of Bazzas and Lemguins, possessing a similar attack pattern of flying in lines from one hole in their tree to another. Despite being enemies, some Swoopies can be unintentionally helpful, as if a Swoopy misses a Kong it sometimes gets stuck in a wall and can be used as a platform. In the mandatory worlds of Donkey Kong Country 3, a Swoopy is only encountered briefly in one of the levels in the area Kremwood Forest, Springin' Spiders. However, in the optional world Krematoa, the Swoopies have an entire level dedicated to them, called "Swoopy Salvo". Here Dixie Kong and Kiddy Kong have to venture through a large petrified forest, all the while dodging barrages of Swoopies. Several Swoopies have to be used as steps to climb up trees. Swoopies are one of the few enemies from Donkey Kong Country 3 that did not appear again in Donkey Kong Land III. This page was last edited on September 9, 2018, at 12:40.